This is the first in a series of answer posts to reader-submitted questions. Some of these posts may be incorporated into the revised edition of the Learn to Cook book. If I’ve left out any information, or if anything is unclear, please tell me in the comments section so that I can amend this post. Thank you for your help! This article covers how to use butter and how butter affects your recipes; how and why to cream butter; how to make clarified butter; and the difference between salted and unsalted butter. When should butter be soft, cold or pre-melted? This is a complicated question with many variables. Let’s start with cold butter. Cold (or even frozen) butter is what you’ll use in pastry pie crusts, biscuits, and most crumb or streusel toppings. The recipe will usually tell you to “cut in” the cold butter with the dry ingredients (which would be flour in the case of pie crusts; flour and/or oats in the case of streusel toppings). The phrase cut in reflects the manner in which the butter and dry ingredients are combined. Many tools may be used for this: a fork, two butter knives held parallel, a pastry cutter, or your fingertips. (If you are using frozen butter, you can even grate it on the large holes of a cheese grater, demonstrated in this biscuit video.) I find my fingertips to be the most efficient tool, but beginners (because they tend to work more slowly and methodically) may find it quickest with a fork or pastry cutter. I’ve personally never mastered the two-knife method so I can’t recommend it. Detailed instructions on the what, how, and why of cutting in are found in this video and recipe for homemade piecrust. One non-baking use for cold butter is in a beurre blanc sauce. 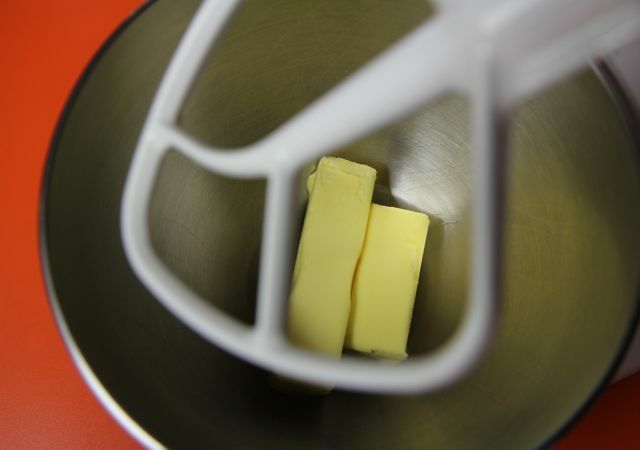 Soft (or “softened”) butter is what you’ll use in most cookie, cake, quick bread recipes, some frostings, and pretty much any recipe which directs you to “cream” the butter or “cream the butter and sugar together“. Softened butter is room temperature butter and is best gotten to that temperature slowly. If you have the time and forethought, leave your butter out on the counter at room temperature for 30-60 minutes before you begin your recipe. When it’s soft enough, it will be easy to cut with a butter knife. The reason for creaming the softened butter is to incorporate air into it, and therefore into the batter to create a light, airy, tender final product with a good rise. 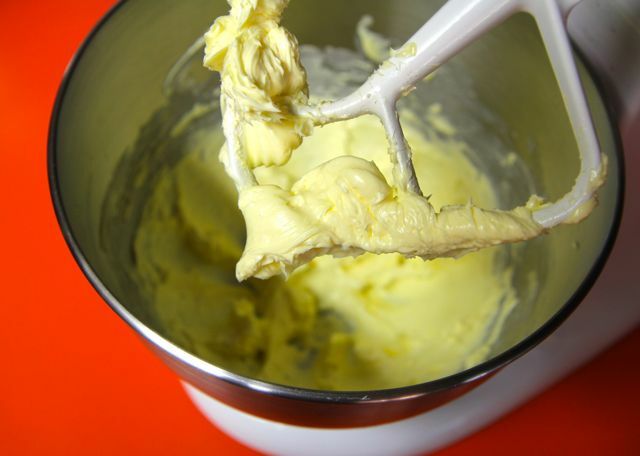 Once your butter is softened, place it in a mixing bowl and use a hand mixer (with the standard beaters) or stand mixer (with the paddle attachment) on medium-high speed to beat it until it looks creamy, slightly paler in color, and slightly more voluminous; it will take 1-2 minutes. This can also be done by hand with a wooden spoon and a lot of elbow grease. Now you can add in the sugar if the recipe directs and continue to beat until it’s even paler and fluffier. Cake recipes will usually call for granulated or superfine (caster) sugar whose microscopic crystalline edges serve to further break the butterfats up and help incorporate even more air to make a light cake. The first time I tried to make chocolate chip cookies I didn’t realize there was a technique to “creaming” butter and sugar. I just thought you mixed them together. So my cookies turned into flat, gooey masses of slop. Now I just buy refrigerated dough. Boooo. See how the corners of the butter stick got dented when it dropped into the bowl? That’s soft. If you’ve gotten ahead of yourself and forgotten to soften your butter ahead of time, you can soften it more quickly by chopping it up and leaving it out for just 10-15 minutes. Alternatively you can soften it in the microwave or over a double boiler, though both of these methods risk melting the butter which may impact the texture, especially of breads and cakes. If you opt for this, use large cubes of butter and watch it carefully. Microwave for only a few seconds at a time, stopping just when the edges begin to melt. Then go ahead and begin to cream it; the interior, colder part of the butter cubes will soften quickly now. Melted butter is what you’ll use for making crumb crusts (as in the graham cracker crust for this key lime pie recipe) and some cookies. Most cookie recipes that call for creaming softened butter can also be made with melted butter, though the texture will be different. Using melted butter results in a thinner, crisper cookie which you may prefer. I do sometimes, especially for gingersnaps and wafer cookies. Melted butter will not work for shortbread cookies. 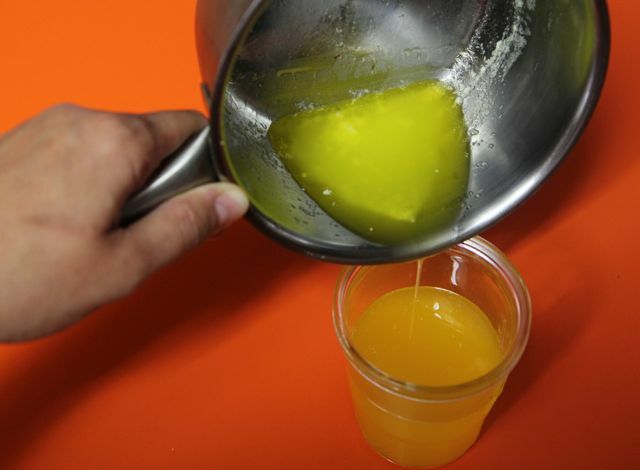 Clarified butter (ghee in India and Asia; drawn butter in the U.S.) is butter that has had all of its water and milk solids (sugars and proteins) removed. It is pure butterfat, giving it a much higher smoke point and a longer shelf life than regular butter. It can be used for sauteeing and other high-heat cooking without burning and because it’s been separated from the solids, it is much lower in lactose and casein and therefore may be acceptable for some dairy-intolerant people. You can clarify any amount you like, but I suggest doing between a half-pound and a pound of butter at once since it lasts so long anyway, that is to say three months covered and refrigerated. Get rid of that curdly, white stuff on top. Feed it to your cat or dog. Carefully pour off the butterfat into a jar. Stop before that white stuff in the bottom pours out. See that stuff in the pot there? Avoid it. Cut the butter into pieces and place in a small saucepan over low heat. Melt the butter slowly without stirring. 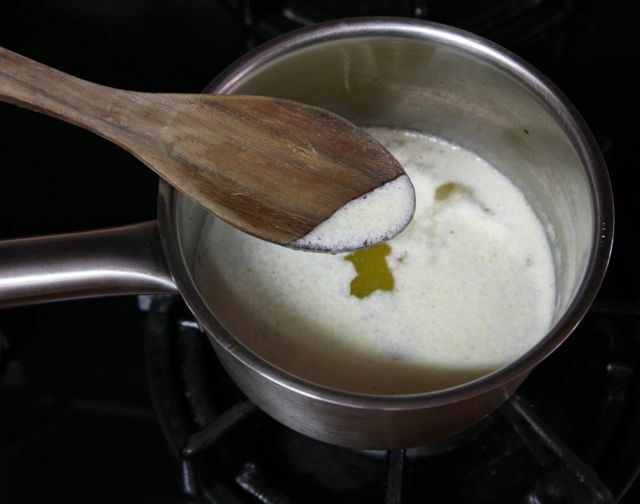 Use a wooden spoon to skim off any white “foam” from the top of the melted butter; discard that stuff. After a minute you will see a layer of solids begin to settle at the bottom of the pot. 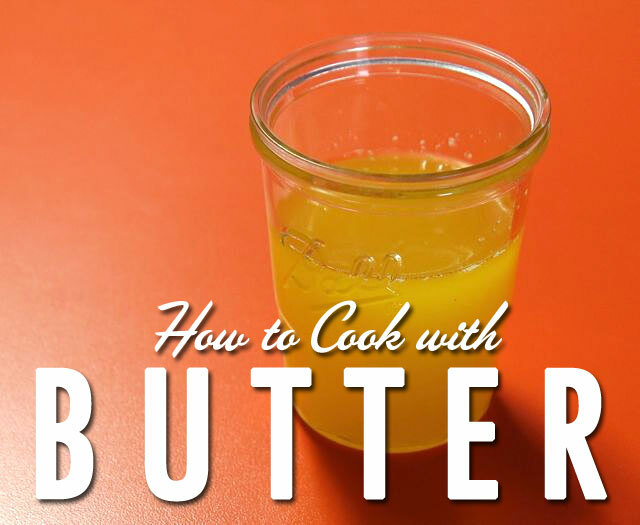 For clarified butter: remove the pot from the heat now and gently pour the butter fat into a clean jar, leaving the milk solids behind in the bottom of the pot. For ghee: continue cooking, without stirring, over the lowest heat possible, until the butterfat takes on a slightly darker golden color. This will take about 10 minutes. Pour the butterfat carefully out into a jar, again leaving the solids behind. Let the clarified butter or ghee cool at room temperature, then screw on the lid and refrigerate. Use for sauteeing and sauces. You’ll find many recipes, especially in baking, that specify unsalted and the reason for this may be two-fold. One, using unsalted butter allows you the cook to determine how salty the finished dish will be. Two, unsalted butter is rumored to be fresher than salted butter, since it isn’t allowed the luxury of lounging around on the shelves, preserved by salt. The first reason is more important to me. I always buy unsalted butter and use it in all my cooking. The only time I even notice is when I’m craving some buttered toast, but even then, you can always sprinkle a little salt on your toast. This is a pastry cutter. They are easily spotted in the kitchenwares department of any store, or you can purchase it through this affiliate link. usually only have lightly-salted on hand. I just eliminate most and/or all the salt that the recipe calls for when using the salted butter. Seems to work. Your information, of course, helps one to control the saltiness and would be especially important for someone with a need to cut salt in their daily diet. Thanks again! Hey Sue! That’s a great solution; thanks for pointing that out. It is funny, too, I don’t ever remember recipes specifying salted/unsalted until about 10 years ago. Makes me wonder what the standard used to be, if there was one. Thank you for such an awesome guide to all things butter. I’ve heard these phrases uttered on many a cooking show, not always understanding what each was, the specific uses for them, or the differences between them (like the benefits of unsalted vs salted butter). My cooking skills have evolved over the years, mainly because of the information I soak up from cooking programs, like yours. Thanks so much! Wow! Thanks for sharing! This was extremely helpful. I usually just microwave the butter and don’t give it a second thought. Thanks for educating me. Thanks for the clarity and the great shots, Hilah. I love a big slab of unsalted butter on my French bread. I could be happy with that alone. As far as baking goes, I usually use what’s on hand – and that’s salted butter. I’ve never faithfully followed the unsalted requirement in a recipe. I only had frzen butter so I melted it. Now pastry crust is too crumbly. I added water and remixed, but still crumbly. Any ideas how to fix? Try balling it up as best you can, wrap it in plastic and refrigerate for an hour. It may adhere better after a rest. Other wise, try adding water a drop or two at a a time. And next time, if you have frozen butter, just grate it up and toss it with the flour! It works perfect like that. how are you? i thank you so much for this help in butter but i have a question and it might be a silly one, a lot of recipes i get when they say butter and or shortening a lot of times they do not specifie if they should be soft or cold. Im thinking from what you said up there when a recipe says cream butter then it should be room temp. but what about the shortening should that be the same as the butter? Great question. Yes, when a recipe instructs you to cream the butter, it should be at room temperature. Since shortening is typically stored in the pantry at room temperature, it is already at the correct temperature for creaming. Hope that helps! thank you so much, i keep my shortening in the fridge after its open because i dont use it that often and it doesnt get ransid. Okay, then you would need to let your shortening sit out at room temperature for a bit before creaming. Glad you are enjoying cooking and baking!